We wanted to applaud all of the assistance dogs (and their trainers) this week. The life-changing effect these dogs for the people they serve cannot be overstated. 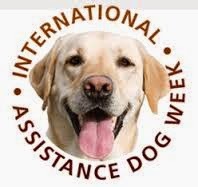 This week is International Assistance Dog Week, it was created to recognize all the devoted, hardworking assistance dogs helping individuals mitigate their disability-related limitations. Assistance dogs can dramatically transform the lives of their human partners by serving as their companion, helper and aide. The people who they serve have debilitating physical or mental disabilities and the ability of these dogs to give a person back their independence is truly remarkable.